We're pretty sure The Machan needs no introduction. Located around 2 hours away from Pune, near Pawna - The Machan is tucked away in the middle of one of 25 biological hot-spots in the world. 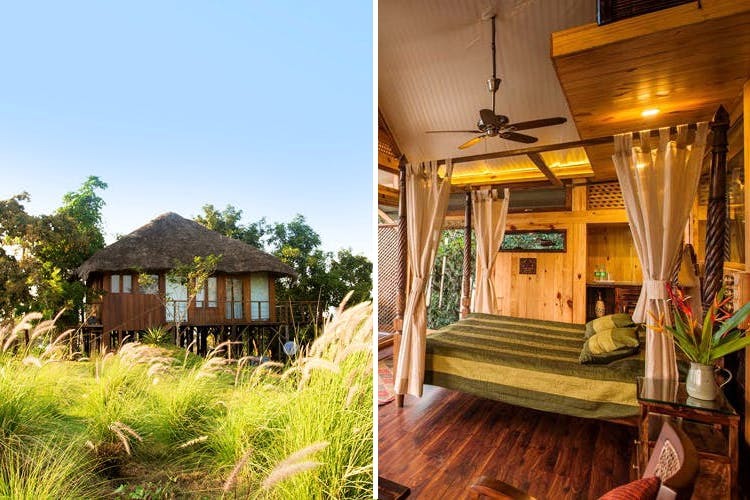 Featuring 6 luxurious themed tree-house suites (and one lovely Machan at ground level), this getaway is super-romantic and ideal to visit during the monsoon season. Enjoy scenic views of the lush valleys and waterfalls, cosy up by the fire-side, or enjoy a relaxing soak in an outdoor bath-tub. Additional activities here include birding, trekking, and yoga - but you can also take some time for yourself and your beau at their on-site spa. Forest Hills at Tala tout themselves as a 'serene eco-mountain valley getaway - and we tend to agree. This gorgeous retreat is located about 4 hours away from Pune, nestled in the forest near the Tala caves (hence the name). Out of several accommodation options here, their 2 tree-houses and one tree-top villa are definitely on our bucket-list! Described as, 'rustic with the right amount of luxury', these beautiful suites offer both privacy, romance, and panoramic views of Raigad valley - enveloped in a cosy green 'hug' among the leafy tree-tops. Anchaviyo Resort is an eco-friendly luxury property, located on the banks of the Vaitarna River in the Palghar district. Situated right in the lap of nature, close to the town of Wada - it's about a 5.5 hour drive from Pune. Anchaviyo has a beautiful tree house suite - built around a Peepal tree - that accommodates 2 people. Overlooking the river, it offers stunning views, a rooftop plunge-pool, and beautiful interiors. This well-kept secret is an oasis in itself, and we think it would make an ideal destination for a romantic getaway, or even a solo trip. Amrute’s Nisarga Sahavas is a boutique farm-stay, which practices responsible agro-tourism. Getting here will take you between 5.5 - 6 hours by road, but we think it's worth the drive. We were swooning over their 'bird’s nest' style tree huts - which are private, romantic, and just perfect for a couple’s getaway. Run by the Amrute family, one of the highlights here is their organic farm – which you can enjoy a guided tour of, as well as sign up for a cooking or farming demo, kitchen gardening workshop, or play with some of the farm pets! O'Nest Home-stay is a lovely rustic Konkan property, located about a 5.5 hour drive away from Pune, in Devrukh. There's a lovely tree-house here that sleeps two and is perfect for a quiet, romantic getaway. It's very reasonably priced and would be perfect for some rest and relaxation, away from busy city life. Unlike its predecessors on this list, O'Nest has more humble accommodation and promises you the best of Konkan hospitality and food. Bird-watching, trekking, river fishing, table-tennis and pottery are some of the recreational activities you can partake in, here.